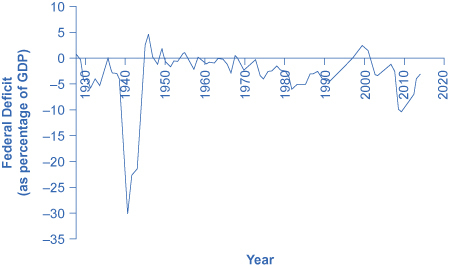 Figure 1 shows the pattern of annual federal budget deficits and surpluses, back to 1930, as a share of GDP. When the line is above the horizontal axis, the budget is in surplus. When the line is below the horizontal axis, a budget deficit occurred. Clearly, the biggest deficits as a share of GDP during this time were incurred to finance World War II. Deficits were also large during the 1930s, the 1980s, the early 1990s, and most recently during the 2008-2009 recession. Figure 1. Pattern of Federal Budget Deficits and Surpluses, 1929–2014. The federal government has run budget deficits for decades. The budget was briefly in surplus in the late 1990s, before heading into deficit again in the first decade of the 2000s—and especially deep deficits in the 2008-2009 recession. (Source: Federal Reserve Bank of St. Louis (FRED). http://research.stlouisfed.org/fred2/series/FYFSGDA188S). Another useful way to view the budget deficit is through the prism of accumulated debt rather than annual deficits. The national debt refers to the total amount that the government has borrowed over time. In contrast, the budget deficit refers to how much the government has borrowed in one particular year. 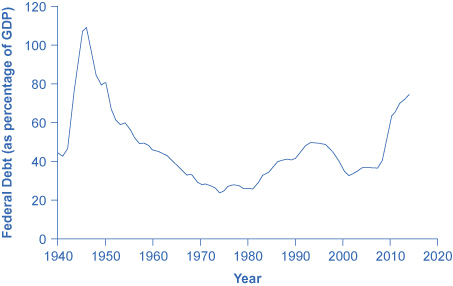 Figure 2 shows the ratio of debt/GDP since 1940. Until the 1970s, the debt/GDP ratio revealed a fairly clear pattern of federal borrowing. The government ran up large deficits and raised the debt/GDP ratio in World War II, but from the 1950s to the 1970s the government ran either surpluses or relatively small deficits, and so the debt/GDP ratio drifted down. Large deficits in the 1980s and early 1990s caused the ratio to rise sharply. When budget surpluses arrived from 1998 to 2001, the debt/GDP ratio declined substantially. The budget deficits starting in 2002 then tugged the debt/GDP ratio higher—with a big jump when the recession took hold in 2008–2009. The deficit is not the debt. The difference between the deficit and the debt lies in the time frame. The federal deficit (or surplus) refers to what happens with the federal government budget each year. The public (or Federal government) debt is accumulated over time; it is the sum of all past deficits and surpluses. If you borrow $10,000 per year for each of the four years of college, you might say that your annual deficit was $10,000, but your accumulated debt over the four years is $40,000. Why did the budget deficits suddenly turn to surpluses from 1998 to 2001 and why did the surpluses return to deficits in 2002? Why did the deficit become so large after 2007? Figure 3 suggests some answers. 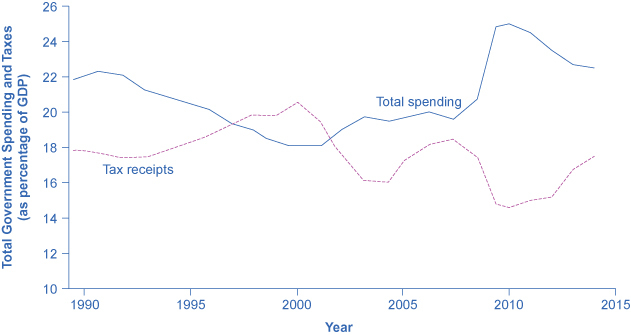 The graph combines the earlier information on total federal spending and taxes in a single graph, but focuses on the federal budget since 1990. This sharp increase in tax revenues and decrease in expenditures on transfer payments was largely unexpected even by experienced budget analysts, and so budget surpluses came as a surprise. However, in the early 2000s, many of these factors started running in reverse. Tax revenues sagged, due largely to the recession that started in March 2001, which reduced revenues. Congress enacted a series of tax cuts and President George W. Bush signed them into law, starting in 2001. In addition, government spending swelled due to increases in defense, healthcare, education, Social Security, and support programs for those who were hurt by the recession and the slow growth that followed. Deficits returned. When the severe recession hit in late 2007, spending climbed and tax collections fell to historically unusual levels, resulting in enormous deficits. Longer-term U.S. budget forecasts, a decade or more into the future, predict enormous deficits. The higher deficits during the 2008-2009 recession have repercussions, and the demographics will be challenging. The primary reason is the “baby boom”—the exceptionally high birthrates that began in 1946, right after World War II, and lasted for about two decades. Starting in 2010, the front edge of the baby boom generation began to reach age 65, and in the next two decades, the proportion of Americans over the age of 65 will increase substantially. The current level of the payroll taxes that support Social Security and Medicare will fall well short of the projected expenses of these programs, as the following Clear It Up feature shows; thus, the forecast is for large budget deficits. A decision to collect more revenue to support these programs or to decrease benefit levels would alter this long-term forecast. In 1946, just one in every thirteen Americans was over age 65. By 2000, it was one in eight. By 2030, one American in five will be over age 65. Two enormous U.S. federal programs focus on the elderly—Social Security and Medicare. The growing numbers of elderly Americans will increase spending on these programs, as well as on Medicaid. The current payroll tax levied on workers, which supports all of Social Security and the hospitalization insurance part of Medicare, will not be enough to cover the expected costs, so what are the options? Long-term projections from the Congressional Budget Office in 2009 are that Medicare and Social Security spending combined will rise from 8.3% of GDP in 2009 to about 13% by 2035 and about 20% in 2080. If this rise in spending occurs, without any corresponding rise in tax collections, then some mix of changes must occur: (1) taxes will need to increase dramatically; (2) other spending will need to be cut dramatically; (3) the retirement age and/or age receiving Medicare benefits will need to increase, or (4) the federal government will need to run extremely large budget deficits. The United States is not alone in this problem. Providing the promised level of retirement and health benefits to a growing proportion of elderly with a falling proportion of workers is an even more severe problem in many European nations and in Japan. How to pay promised levels of benefits to the elderly will be a difficult public policy decision. Review these concepts and learn about the differences between deficit and debt in the following video.